CELBRIDGE have made a big statement about their intentions for the 2019 season with the appointment of former Dublin star Paul Curran as their manager. The former wing back was awarded the Footballer of the Year in Dublin’s All-Ireland winning year of 1995 and picked up three All-Stars during his career, along with six Leinster titles. Since going into management, his CV is equally as impressive. He won a Dublin and Leinster SFC title in 2012 with Ballymun Kickhams and led them to an All-Ireland final in 2013, where they were beaten by Roscommon’s St Brigids. As fate would have it, Curran went on to gain revenge on St Brigids after he was appointed manager of their Roscommon rivals Clann na nGael late in 2014. Curran’s team beat St Brigids in the semi-final the following year, stopping their attempts to win a seventh county title in a row, and completed the job by beating Padraig Pearse’s in the final. 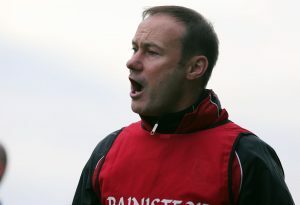 For the last two seasons he has managed St. Oliver Plunkett Eoghan Ruadh in Dublin. Now his attentions turn to Kildare football, and Celbridge in particular. “I met the committee last week and it just seems to a very good fit, a good club, a hard-working club,” said Curran. He admits that he does not have an in-depth knowledge of Kildare football but he is already working on improving that. “I wouldn’t know much about Kildare football other than who tends to win the Championships, I wouldn’t know too much detail about the Celbridge squad either but I have been doing a bit of stuff on it over the last week or so. Really, I’m going in like any other manager, I’ll find out what we have when we get down to work,” said Curran. “There’s a lot of good teams in Kildare. Championships are very hard to win and obviously the football is very good. You have the current Leinster Champions in Moorefield and there are some other superb clubs there as well. It’s going to be a difficult and challenging job but I am looking forward to getting started,” added Curran. He has a reputation of ending championship droughts at the clubs he has been at. Curran led Ballymun to their first Dublin title in 24 years and Clann na nGael to their first Roscommon title in 19 years. He now hopes to do the same with Celbridge. “After I finished up with Ballymun I went to down to Roscommon and did two years down there. I enjoyed that, they were a very traditional club but had kind of gone asleep for a few years but you can kind of tap into that, the tradition was huge in the club and we ended up getting over the line there and breaking the Brigids stranglehold. It’s a different sort of challenge with Celbridge, they’ve only won one Championship so you have to create a culture there, a culture that the likes of Moorefield and Sarsfields have. That takes a lot of work and a bit of commitment but I am looking forward to it I must say. “We all start out with the same goals, we all want to be successful at the end of the year and I am no different to any other manager around the country. That’s where we are at, there is an awful lot of work to do before we can start thinking about that (winning a county title) but it is always at the back of the mind. There’s a huge amount of work to be done but Celbridge have very good structures in place. They are producing good footballers but they have only won one Championship, 10 year ago now. As I said, it’s always difficult to win a Championship but we’ll get to work straight away and see where it brings us,” he said. Curran will be the first Dubliner to take the reins at the Hazelhatch Road outfit since Barney Rock led them to their only title in 2008 but he hasn’t yet talked to his fellow Dublin legend about the club. “No, I didn’t speak to Barney. This is only breaking news really, I was only ratified on Monday evening,” He said. With Davy Burke appointed at Sarsfields and Philly Wolfe at Carbury, and Moorefield gearing up for a shot at a third title in a row under Ross Glavin, next season’s Kildare SFC is already shaping up to be an intriguing battle. “We’ll meet the players early next month and get cracking early in 2019. I’m looking forward to it, it’s a great challenge. I’ve been in other counties other than Dublin and it is always a challenge to get to know the group and get them playing to their potential. It’s no different but this is one that I am looking forward to and I’m excited about it,” said Curran.